LEGO IDEAS - Design a virtual floor for the LEGO Tower game! If you could include your very own, customized floor in a LEGO Tower, how would it look? 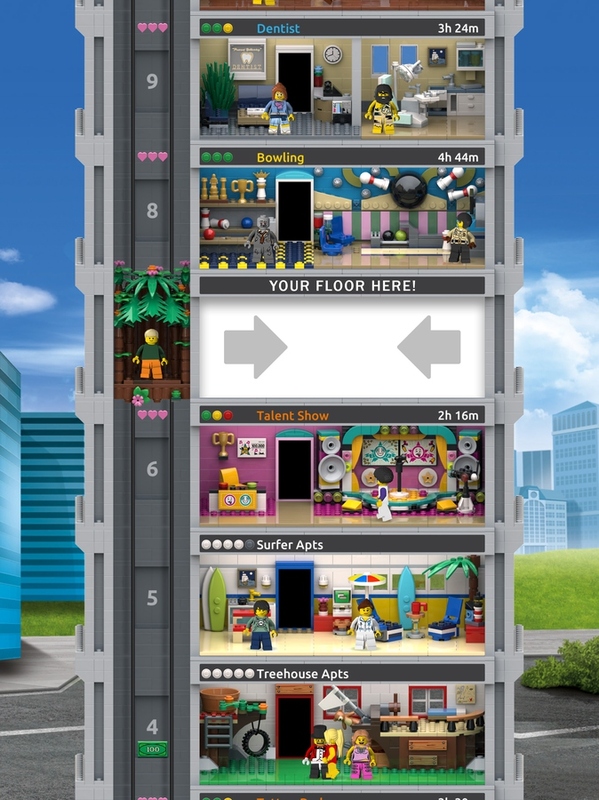 We challenge you to build a virtual LEGO floor that fits within the brand-new LEGO Tower game. Make sure you build an awesome place to hang out, because your design could end up in the actual LEGO Tower game launching this summer. So, open your digital LEGO building tool and unleash your creativity to get your very own floor included in the LEGO Tower game! Six winners will get their winning room integrated into the LEGO Tower game launching this summer. 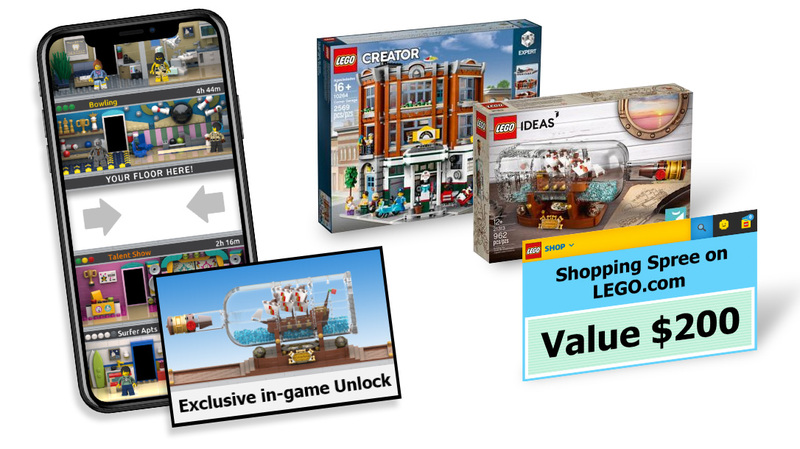 On top of that, each winner will get the LEGO Creator Expert 10264 Corner Garage, the LEGO Ideas 21313 Ship in a Bottle, a $200 shopping spree on shop.LEGO.com and a very special unlock feature in the new LEGO Tower game. ENTRY DEADLINE: Submit your digital entry no later than May 2nd, 2019 at 6:00 a.m. EST. If you’re not sure what time zone you’re in, here’s a time zone converter. Submission Phase - Build and submit your entry before May 2nd 2019 at 6:00 a.m. EST. We recommend submitting your entry 2-3 days before the deadline in the event we have to return it to you for changes. Judging Phase - Our judges review the entries and choose the winners by May 10th, 2019. Winners Announcement  - We share the six winners here on LEGO Ideas no later than May 22rd, 2019! Submissions must be built with a digital building tool such as LEGO Digital Designer. You’re welcome to use image editing tools, such as Photoshop, to enhance your photos/presentation. Take up to five photos of your creation and submit them to the contest. Make sure to show off all angles and any features or functions of your creation. Please submit your photos in as high a resolution as possible so that we can see all the details clearly. If possible, the shortest edge should be at least 1080 pixels. Your entry must be built with a digital building tool such as LEGO Digital Designer, or third-party 3D LEGO building software. You’re allowed to use all LEGO elements that can be found in the digital building tool, including LEGO System, LEGO DUPLO and LEGO TECHNIC elements. 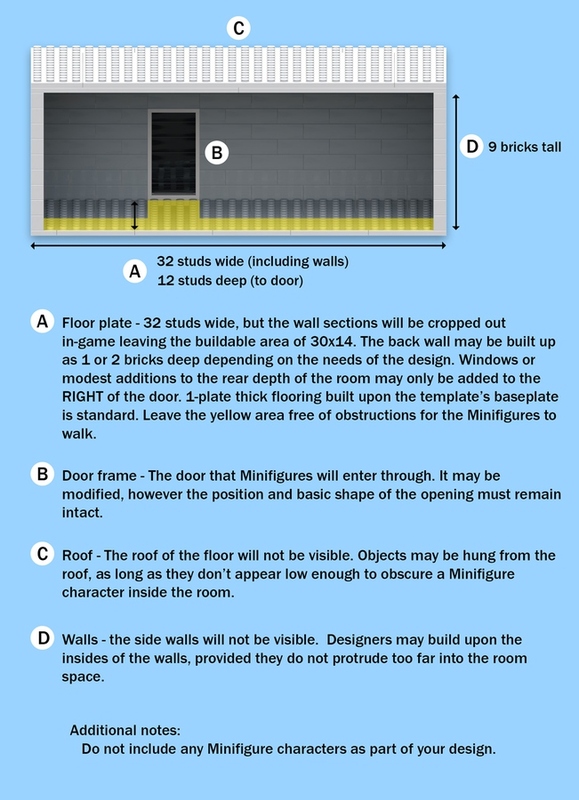 Update 27 March: Added requirement that the yellow area in the guide below is kept free of obstructions for the Minifigures to walk. Unfortunately, elements exclusively from sets based on an intellectual property (IP) can’t be included in the LEGO Tower game, so please refrain from using elements related to third-party intellectual property, e.g. LEGO Star Wars™, LEGO Harry Potter™ or even The LEGO Movie. If an IP element is used mistakenly, and your submission is selected as a winner, the element in question will be removed/replaced before integration into the LEGO Tower game. Your submission may also not be based on any third-party intellectual property, e.g. Star Wars (or other entertainment franchises), automotive brands, existing buildings, etc. It's time to be really creative! Please don’t include any Minifigures in your build. You may submit digital entries using LEGO Digital Designer, which is available for download via this link free of charge. Any entries made in LEGO Digital Designer should not show the baseplate from build mode. You may also create digital entries using third-party LEGO CAD software. Please do not include people or limbs in pictures you submit. Photos containing such will be removed. You may submit multiple entries to the contest, but only one entry per person will be considered when winners are selected. Winners will be contacted on the email address associated with their LEGO ID account after May 10th, 2019. Winners will be announced on LEGO Ideas when all winners have returned the signed Winner’s Certification Documents. A winner who does not return their Winner’s Certification Document within one week (5 days) of receiving it will be disqualified, and a new winner will be selected.